To cats and dogs, your purse or backpack is like an amusement park. They can find all kinds of knick-knacks to nuzzle, sniff, and chew. The problem is; not all the contents in handbags and backpacks are safe for pets. According to the veterinarians at Pet Poison Helpline, backpacks and handbags are reservoirs for things toxic to dogs and cats. 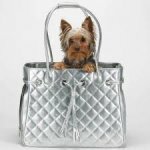 Here are the five most common purse items that are toxic to pets. Many people carry chewing gum in their purses and backpacks. What you may not realize is that, if ingested by a dog, it can be fatal. Most sugarless gums, including some Trident, Orbit, and Ice Breaker brands, contain xylitol, a sweetener that is toxic to dogs. Some sugarless mints and flavored multi-vitamins may also be made with xylitol. When ingested, even small amounts of xylitol can result in a life-threatening and rapid drop in blood sugar, and if large amounts are ingested, dogs can suffer from severe liver failure. Signs of xylitol poisoning include vomiting, weakness, difficulty walking, collapse, tremors, and seizures. As few as three cigarettes can be fatal to a small dog, depending on the "strength" or "lightness" of the cigarettes. Warning: After ingestion, clinical signs of distress can become apparent in as little as 15 minutes. Cigarettes, chewing tobacco, and even gum (Nicorette) contain nicotine, which is toxic to dogs and cats. Exposure causes high heart and respiratory rates, neurological overstimulation, uncontrolled urination, defecation, tremors, seizures, paralysis, and death. Asthma inhalers, when accidentally chewed and punctured by dogs, can cause severe, life-threatening, acute poisoning. Because inhalers often contain concentrated doses (often 200 doses in one small vial) of beta-agonist drugs (e.g., albuterol) or steroids (e.g., fluticasone), dogs that bite into them are exposed to massive amounts of the drugs all at once. This can lead to severe poisoning, resulting in life-threatening heart arrhythmias, agitation, vomiting, and collapse. Medications in pill bottles are irresistible to some dogs because they resemble toys that rattle. Each year nearly half of the calls to Pet Poison Helpline involve ingestion of potentially toxic human medications. Common drugs including NSAIDs (e.g., Advil, Aleve, and Motrin), acetaminophen (e.g., Tylenol), and antidepressants (e.g., Effexor, Cymbalta, and Prozac) can cause serious harm to dogs and cats when ingested. NSAIDs can cause stomach and intestinal ulcers as well as kidney failure, especially in cats. A single Tylenol tablet containing acetaminophen can be fatal to cats, and in dogs, a larger ingestion can lead to severe liver failure. Of all the medications, antidepressants account for the highest number of calls to Pet Poison Helpline. They can cause neurological problems like sedation, incoordination, agitation, tremors, and seizures. Hand sanitizer has become a common item in handbags. Many hand sanitizers claim to kill almost 100 percent of germs. This is possible because they contain high amounts of alcohol (ethanol)-sometimes up to 95 percent. Therefore, when a dog ingests a small bottle of hand sanitizer, it can have the same effect as a shot of hard liquor. This can cause a severe drop in blood sugar, in coordination, a drop in body temperature, neurological depression, coma, and death. The bottom line? Store your handbags and backpacks out of reach: When in doubt, hang it up. Please call our animal hospital if you have a question about the toxicity of any products.